What a bright idea! 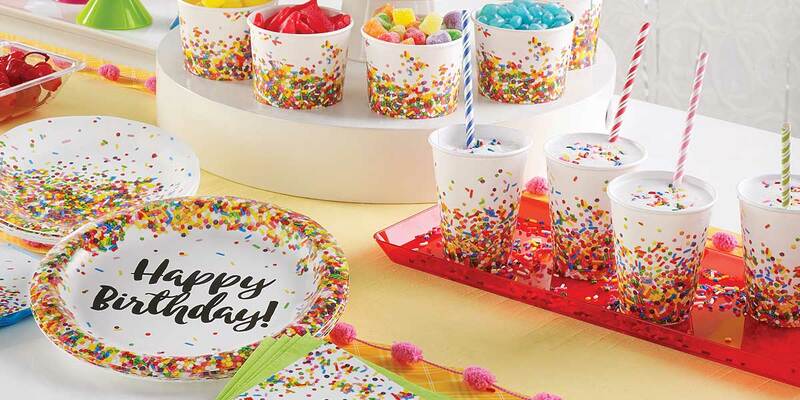 Our Sprinkles collection creates a colorful setting for birthday of all ages. A rainbow of multicolored sprinkles brightens the assortment, which also includes metallic balloons, dizzy danglers, party hats, centerpieces and more. It has everything it takes to kick off a great party! Accents in Red and Bermuda Blue from our Solid Color Tableware line-up add bright solids to the look. Sprinkles Plastic Tablecover 54"x 102"